On Monday, make your packed lunch more special by preparing a 5-star dish. No worries! 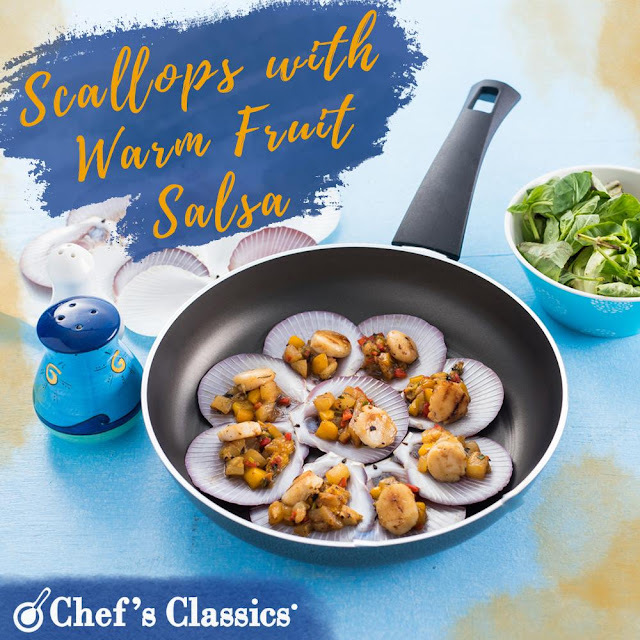 This scallops with warm fruit salsa recipe is incredibly easy! Everyone's going to want a taste of your baon! 1. Pat the scallops dry with paper towels, and season it with salt and pepper. Heat the Chef's Classics Melissa Fry Pan with olive oil on medium to high heat. Seared the scallops 2 to 3 minutes on each sides or until done. Remove scallops from pan and set aside. 2. Using the same pan, in a medium to high heat, add oil and saute the garlic, red bell pepper, pineapple, mango, soy sauce, spring onion and mint. Season it with salt and pepper to taste. Scrap the pan to loosen browned bits and cook for 3 minutes. 3. To serve, mix the seared scallops and warm fruit salsa together.